PlayGround has announced the topic for the eleventh annual Monday Night PlayGround “Math Night”, presented in association with Mathematical Sciences Research Institute (MSRI) and taking place at 8pm, Monday, February 17 at Berkeley Repertory Theatre. That topic, A PASSION FOR PRIMES, will lead to the creation of more than thirty short plays, of which six will be selected for presentation on February 17. 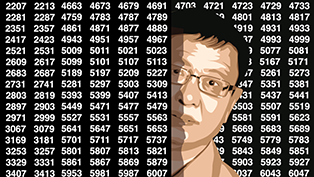 For additional information on the topic and its inspiration, mathematician Yitang Zhang and his recent breakthrough on the twin primes conjecture, visit http://playground-sf.org/topic. Selected plays will be announced via Facebook and PlayGround’s website on Friday, February 14. For tickets and more information, visit http://playground-sf.org/monday. PlayGround audiences will get to enjoy a unique behind-the-scenes perspective, with a free pre-performance discussion on February 17 at 7:10pm, led by MSRI Director David Eisenbud and featuring mathematics documentary filmmaker George Paul Csicsery (currently working on a documentary about mathematician Yitang Zhang), mathematics and science journalist Erica Klarreich, and the selected PlayGround playwrights. Audience members can also experience the thrill of being a producer through the monthly People’s Choice Awards, helping to determine which plays and playwrights go on for consideration in PlayGround’s annual showcase, the Best of PlayGround Festival. PlayGround, the Bay Area’s leading playwright incubator, provides unique development opportunities for the Bay Area’s best new playwrights, including the monthly Monday Night PlayGround staged reading series, annual Best of PlayGround Festival, full-length play commissions and support for the production of new plays by local playwrights through the New Play Production Fund and, PlayGround’s newest initiative, the PlayGround Film Festival. To date, PlayGround has supported nearly 200 local playwrights in the development and staging of over 680 original short plays and 50 new full-length plays, including more than a dozen that have since premiered in the Bay Area. For more information, visit http://playground-sf.org. The Mathematical Sciences Research Institute (MSRI) is dedicated to the advancement and communication of fundamental knowledge in mathematics and the mathematical sciences, to the development of human capital for the growth and use of such knowledge, and to the cultivation in the larger society of awareness and appreciation of the beauty, power and importance of mathematical ideas and ways of understanding the world. From its beginning in 1982 the Institute has been primarily funded by the National Science Foundation (NSF) with additional support from other government agencies, private foundations, and academic sponsors and corporate partners. Approximately 2,000 mathematical scientists visit MSRI each year, many for substantial periods. WHAT: Occurring monthly, October-March, the popular Monday Night PlayGround series presents staged readings of thematically-connected short works by the Bay Area’s best new playwrights each month at Berkeley Repertory Theatre, staged by leading local professional actors and directors. The given topic for the February 17 PlayGround “Math Night”, presented in association with Mathematical Sciences Research Institute (MSRI), is “A PASSION FOR PRIMES,” inspired by the work of mathematician Yitang Zhang and subsequent breakthroughs by the Polymath Project and James Maynard. PlayGround Announces 2014 Gala Honorees!